In 1937 the Nazi regime held two exhibitions in Munich: one to stigmatize "degenerate art," and one, personally curated by Hitler, to glorify "classic art." 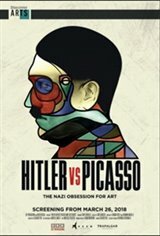 Narrated by Toni Servillo (star of Oscar® winner The Great Beauty), *Hitlervs Picasso and the Others* is an incredible journey through four exhibitions, displaying masterpieces by Botticelli, Klee, Matisse, Monet, Chagall, Renoir, and Gauguin. Linked to each exhibition are moving stories of those who witnessed the systematic destruction and looting of the day - from the Bernheimer family, who were forced to barter their freedom, to "Hitler's dealer," Cornelius Gurlitt, known to have hidden away some of themost priceless art treasures of the century.